Maybelline Dream Satin Skin...Is Really A Dream! So I was sent a "product review" request by one reader via IG account and I promised her I'll have a look! I was too busy to shop for makeup recently then these 2 fell on my lap! P.S. Sorry for the messy polish, I am testing out Solique Gel Polish and been wearing it for more than a week! Introducing, the newest face base product from Maybelline New York. The powder is a bit dark on pan but I was surprised how it immediately disappeared on my hand when swatch. (Above blue line). The liquid foundation in O4 is obviously too dark for me! I regret how the shade does not match my skin tone because.....like I said over title...it is a dream! Why do I have this felling that Maybelline actually perfected their face makeups? Since the most recent base makeup I tried from Maybelline are all GOOD! 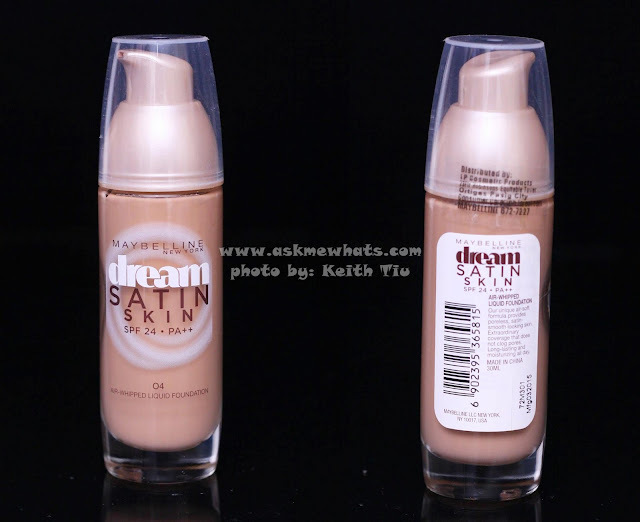 Now let's talk about my ultimate favorite --- Dream Satin Skin SPF24 PA++ Air-Whipped Liquid Foundation. It comes with pump-packaging so I find this perfect! As I know 1 pump will always be the perfect amount for the whole face! The texture of this liquid foundation is lightweight yet it gives me medium to medium heavy coverage! The effect is just amazing! After the application of first layer, Mr. AMW exclaimed how nice the "finish" was. My skin looks even yet glowing at the same time! All the redness, dark undereye circles and spots were masked without me giving an extra effort for a second or third layer. I can even skip concealer at this stage! That is, of course if your skin issues are minimal! If you have major breakouts, I still believe the Maybelline Dream Satin Skin Air-Whipped Liquid Foundation can actually lessen concealer application due to its' coverage. Check out the closer look of me wearing this foundation. It does not settle into fine line sand wrinkles and it gives a semi-matte finish. For users who have normal or dry skin, you can actually get away wearing only this! The downside of not setting this product is how my face looks a bit oily especially on the T-zone when the sun is at its' peak! It isn't obvious on photo but I look a bit orange in this shade! 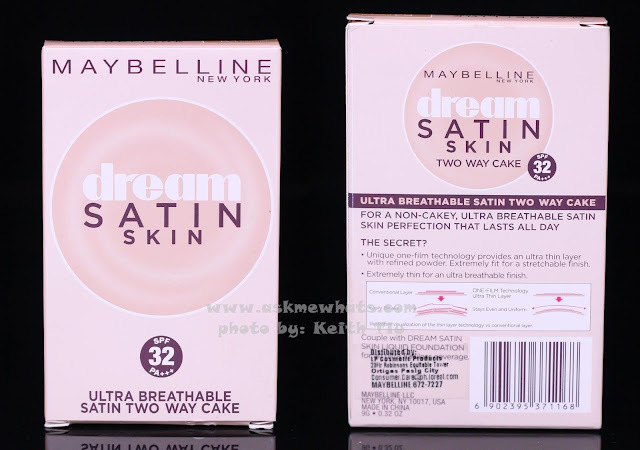 NExt is the Dream Satin Skin Ultra Breathable Satin Two Way Cake. A two Way cake means it can be used wet or dry! B4 Caramel looks dark on pan, it is actually a shade or 2 darker than my face but I actually like how it matches my skin tone after application. I may use this to "set" my BB creams or CC creams because they are mostly lighter than my skin. THe packaging is still the same "Maybelline" plastic packaging but I like the rose pink shade a bit more posh than the usual Maybelline "green". It comes with a huge mirror and a sponge that is good for wet and dry application. I personally like to apply my Two Way Cake products DRY. BUT, if you have skin issues and need more coverage than usual, applying this product WET with patting motion will give the same effect as wearing liquid/cream foundation! I used this to "set" my liquid foundation underneath with a patting motion dabbing only on areas that seems to "oil" up. I leave the rest bare because I like the "Glow" the liquid Foundation gives! This powder gives a "matte finish". So if you like dewy looking skin, apply the cake foundation only on T-zone. These 2 products from Maybelline definitely earned 2 thumbs up from AMW! I am so amazed with the coverage, the texture and finish of both products and will highly recommend this to EVERYONE! Great job Maybelline, now, I'm off to grab the right shade! thanks sis, it is the foundation! it's really nice! 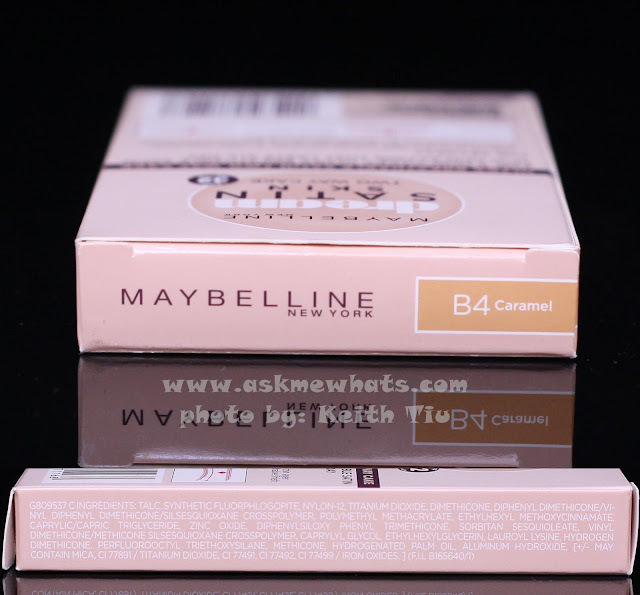 I love Maybelline products, I've been using them for years :-) thanks Nikks for the review, miss u! I know sisterette! I miss you!! I guess compared with the white superfresh this one has a more natural coverage? It looks sooo smooth! lol natawa ako sa 5years from now! you must have a lot of foundations! I love the Revlon Colorstay since I have a very oily skin and I'm very satisfied with it. I'm thinking of trying maybelline dream satin liquid foundation, do you think that will be better than revlon or at least comparable? Gusto ko po sana bumili kaso di ko alam kng ano shade babagay saken. Advice naman po please.